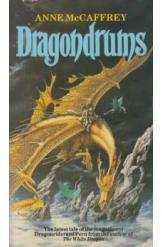 Dragondrums by Anne McCaffrey, Sci Fi. Book is in good condition, all pages intact. Piemur, a boy soprano at Pern's musical academy of Harperhall, finds his future threatened by the sudden loss of his voice. To keep his home among the harpers, he takes on an undercover mission for the masterharpers involving a fire lizard smuggling ring, and ends up discovering something that could change everything. Part of the Dragonriders of Pern series.